Elastic compression stockings or compression therapy narrow the veins, decrease venous volume and reduce venous reflux by shifting blood volume from the compressed extremity to central regions of the body. It also improves the venous pumping ability. Compression therapy is effective in relieving swelling and pain and it can be used alone or in combination with other therapies but compliance is usually poor. There are also alternative medical or herbal therapies that have a proven benefit in the treatment of symptoms related to varicose veins. In general, these compounds help reduce pain, cramps, heaviness, and paresthesia symptoms compared to placebo. They can also help reduce the severity of edema and decrease in calf and ankle circumference. One of the common minimally invasive options to treat varicose or spider veins is sclerotherapy. 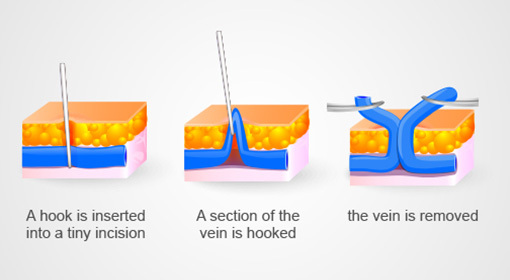 Sclerotherapy is a treatment in which a chemical solution is injected into diseased or damaged veins. This solution irritates the vein lining causing it to undergo fibrosis, closure and eventually disappear, so that these abnormal veins can no longer fill with blood. After each injection gauze and tape are applied to create compression over the injected area. At the end of the procedure, external compression is applied using support hose. 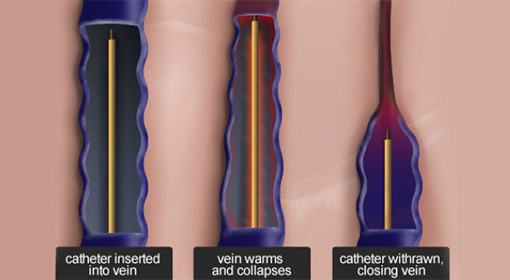 The compression causes the vein walls to seal together and the vein can no longer transport blood. Your body breaks down and absorbs the damaged vein. In few weeks, the treated vein will be “absorbed” by the body as blood flow is re-routed to other veins. When healing is complete the vein is no longer visible. The process is very similar to how your body heals a bad bruise. Multiple treatments may be needed to close the damaged vein. Your physician will perform these treatments in an office or clinic. Laser therapy is used to heat the blood vessel and shrink it. 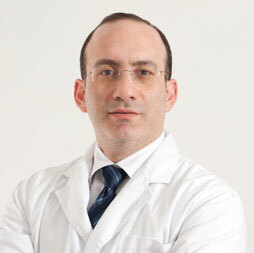 It is effective for the treatment of very small varicose veins and spider veins. Laser therapy may be used as an additional treatment after sclerotherapy, endovenous procedures or surgery of larger veins. It has emerged as a viable and effective treatment option, especially when treating patients with needle phobias. Blood in the spider or varicose veins preferentially absorbs laser wavelengths between 800 to 1,100 nm. One such laser is the 1,064 nm Nd:YAG. Using an air cooling system over the skin, this therapy can be performed with minimal or no significant discomfort. The course of the vein is treated with laser pulses. 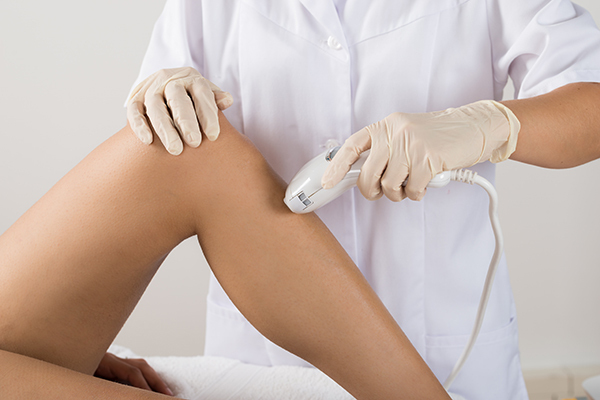 Laser therapy may require several sessions, spaced at 4 to 6 week intervals, to properly treat the vein. Patients will usually require between 2 and 4 treatment sessions to achieve optimal results. Phlebectomy is a minimally-invasive surgical procedure that removes bulging varicose veins through multiple small 2–3 mm incisions in the skin overlying the varicose veins.